Last week an old friend coaxed me out of retirement to give a couple of classes to his conference interpreting students. (They're in a Master in Conference Interpretation programme at a private Spanish university, the Universidad Europea.) A lively bunch, they got around to discussing with me the differences between interpreting and written translation. The first thing they all mentioned was of course the medium: voice. (We didn't touch on sign language.) 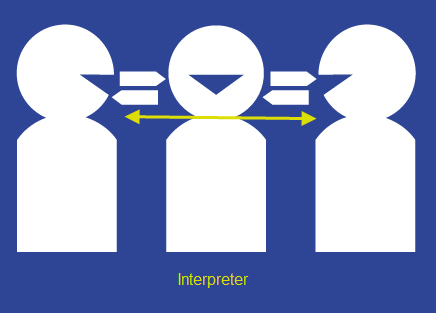 Cultivating a clear voice – and for simultaneous, especially a pleasant microphone voice – is important for Professional Interpreters but people don’t expect it of Natural Interpreters. So it’s beyond the scope of this blog, except to mention that there’s an article full of good advice about it by an experienced voice coach in the latest issue of The Linguist (see References). “Undeniably interpreters face unrelenting stress. What form does it take? Should we consider it friend or foe? Can we control it; even make an ally of it? "The data placed simultaneous interpretation in the category of high stress professions and... the data points to psychological and physiological costs. The factors most frequently mentioned as stressful by those participating in the study are difficulties to do with text and delivery (speed, read texts, strong accents, lack of background material and preparation time) and booth discomfort." I would rank the causes of psychological stress as follows. First speed. The Expert Written Translator may average 2,500 words a working day, which would be equivalent to about 400 words an hour. Any interpreter is expected to translate at a normal speaking rate of, say, 100 words per minute. It's amazing that translating can be done at this speed even by untrained interpreters, though they're allowed to ask a speaker to go more slowly. Concentration. The interpreter listens to the speaker, but is no ordinary listener. The ordinary listener can skip what is difficult to understand, can afford at least a moment of inattention. The Expert Interpreter can't afford to miss anything. The Natural Interpreter has the luxury of at least being able to interrupt the speaker in order to do short consecutive; the Expert Interpreter must keep going. The mental effort required explains why conference interpreters, if they work to rule, change over every half hour or so. Longer stretches are possible but exhausting (though I've known conference interpreters go on alone for a whole day and court interpreters often have to do so). Restricted resources. The written translator has a wealth of reference material to draw on, and even more so in this era of the internet. Although an occasional glance a dictionary or a scribbled note from a colleague may sometimes be possible, and Natural Interpreters have the possibility of asking speakers for clarification and even assistance, for 99% of the time the Expert Interpreters must rely on what's inside their own heads. No opportunity for correction.The first version is the final version. Expert Written Translators can, indeed should, review their drafts and improve them, removing perceived errors. They can thereby reach a level of expression that is beyond the reach of Expert Interpreters, whose first thoughts are also their last. Natural Interpreters and sometimes Liaison Interpreters have more scope for "I think they mean... but perhaps it's... Let me check." However, they can't do a lot of it and remain coherent. Public performance. Conference interpreting, and some of its extensions like interpreting for TV, are a performing art. Today the Expert Interpreter may be acoustically scrutinised, and on occasion criticised, by audiences of millions. It's the kind of scrutiny that actors and public speakers must endure, and student interpreters need to have a 'baptism of fire' of it as part of their training. It's also one reason most Professional Written Translators don't want to do interpreting; they prefer to work semi-anonymously at their quiet desks.. Researchers on Language Brokering have posited yet another kind of stress which affects that kind of Natural Interpreter, namely acculturative stress: "responding to competing demands of two cultural worlds on a daily basis" (see References). "The physiological data collected was blood pressure, heart rate and salivary cortisol levels in a sample of 48 interpreters who wore monitors over a 24 hour period." This was the kind of stress that forced me to give up conference interpreting permanently after a serious illness. What can interpreters do to relieve stress? Practice Transcendental Meditation (I did) or some other form of ‘yoga‘. Smoke. Out of fashion socially. But there was a time, terminating around 1980, when conference interpreters smoked, even chain-smoked, in the booth. There’s an old United Nations video that shows it unabashed (see References). Take all necessary measures to stay fit. My cardiologist says that mental stress never killed anybody who was in good shape physically. "No correlation was found between the physiological indices and performance levels." But to take it a step further, perhaps the stress is necessary for the topmost level of performance, as in other performing arts. The AIIC study didn't include adrenalin levels. Sandy Walsh. Release the voice within. The Linguist, June/July 2013, pp. 10-11. You can read it here. Jennifer Mackintosh. The AIIC workload study - executive summary. 2003. Click here. Hans Selye. The Wikipedia article about him is here. Robert S. Weisskirch and Sylvia Alatorre Alva. Language brokering and the acculturation of Latino children. Hispanic Journal of Behavioral Sciences, 24, 2002. Full text here. United Nations Organization. Other Voices. New York: United Nations Film Services, c1975. 27 mins. Although it's old, this is still a classic introduction for students and the general public. I have it on CD if anybody wants a copy. Parents and other family with bilingual children must have noticed since time immemorial that their children could translate. However, the first study of the phenomenon by a trained linguist was published just a century ago this year in French. 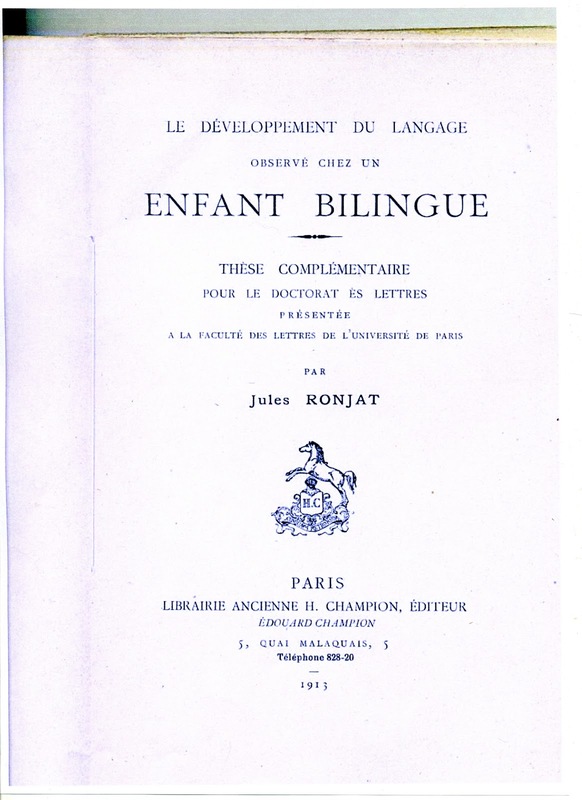 It was Le développement du langage observé chez un enfant bilingue (Language Development as Observed in a Bilingual Child) by the Franco-Swiss linguist Jules Ronjat. Ronjat was French but he taught at the University of Geneva. He was therefore a contemporay there of the great Swiss linguist Ferdinand de Saussure, but there's no indication that they knew one another. Ronjat’s speciality wasn't child language but the study of Occitan, a Romance language still spoken in Southern France and in Catalonia. Indeed it doesn't appear that he ever published again on the subject of child language. We owe this pioneer work, therefore, to the chance circumstance of his having a bilingual child himself. The child was his son Louis. Louis Ronjat was born in 1908 at Vienne, on the River Rhône in France, and observed by his father from birth until fourth year. Louis considered himself trilingual, because besides fluent French and German he also knew a little Franco-Provençal (which is closely related to Occitan). It was not only the first study but the first longitudinal case study of language development in a bilingual child. Its focus is on phonetics, which was a flourishing area of linguistics at the time. However, it contains many interesting examples of translation and related phenomena (e.g. bilingual lexical pairing) produced by Louis at an early age. Louis acquired French and German simultaneously from his parents, their families and their household. His mother was German speaking. 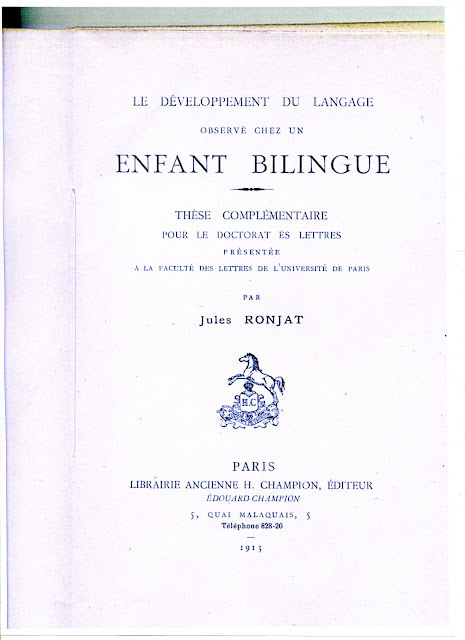 Ronjat and his wife followed the one person one language (OPOL) principle, which Ronjat had learnt from fellow linguist and child language observer Maurice Grammont (see references). The method requires that each parent speak only their own language with the child; the rationale being that infants associate languages with the people who speak them and that OPOL therefore helps them keep their two languages separate. In the same spirit, the Ronjats abstained from making Louis translate for them; therefore his translations were as spontaneous as possible. There was a good deal of personal communication between Ronjat and Grammont, but the latter didn't mention translation. An appendix links Louis’ language development to his general cognitive development. I'm trying to see what can be done to make the book available again outside the libraries. 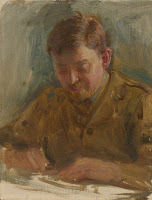 Jules [Antoine] Ronjat (University of Geneva), 1864-1925. Le développement du langage observé chez un enfant bilingue. Supplementary dissertation for Doctorat ès Lettres, Faculté des Lettres, Université de Paris. Paris: Champion, 1913. 155 p. Édouard Champion was a celebrated publisher and bibliophile. He died in 1938 but his publishing house lives on. Maurice Grammont. Observations sur le langage des enfants (Remarks on Child Language), Paris, Klincksieck, 1902. By coincidence, Klincksieck now owns Champion. I first learnt about Ronjat from a reference in a paper by the Canadian educational psychologist Merrill Swain. Then I was extremely lucky: I found a copy of it almost next door to me in the library of the University of Montreal. It hadn't been borrowed for over 20 years. It was probably there because the U of M was already established as a French-speaking university when the book was published and because, being Jesuit, it had a good linguistics department. Later I was able to acquire a copy of my own from a second-hand bookseller. It bears an inscription in Ronjat's own hand, "Bien cordial souvenir (With best wishes) – Jules Ronjat," but I don't know who he sent it to. The image above is from my copy.